Summer Camp fun for the Whole Family! Did you know that we offer family programs in addition to our summer camps? 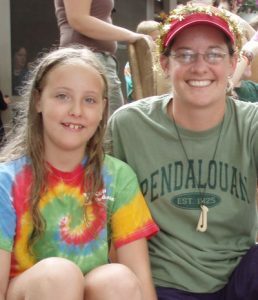 That's right, YOU TOO can take part in camp activities - like archery, campfires, and canoeing - that over 1,000 kids experience every summer. Fill your day swimming on Beautiful Big Blue Lake, conquering our climbing wall or going on a hike in the woods. Each family program also offers several opportunities to enjoy our high ropes course, archery or BB guns, and enjoy a horseback ride. It's your weekend, spend time however you'd like! All activities are offered with our guests in mind, i.e. we ensure safety without treating adults like children. Staff are available to assist with kids so that grown-ups may enjoy activities as well. Family campers can join in any offered activity or simply do their own thing! Hot and filling meals are served family-style in rustic Nikana Lodge. We have a variety of offerings at every meal, including vegetarian options. Cold water, fresh fruit and peanut butter and jelly are available through-out the day. Cabins are selected prior to arrival and can be shared with friends, old and new. Best of all, we do the cooking!!! Enjoy 4 days of relaxation on the banks of beautiful Big Blue Lake! Paddle clear waters in a kayak or canoe, enjoy wooded paths on horseback or nap with the sounds of nature in our hammocks and swings. 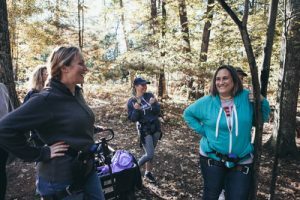 Qualified staff run fun and safe activities, including: crafts, target sports, high ropes course and zipline, hikes, campfires and outdoor cooking. Experience a great day at Lake Michigan, where we provide a cook-out dinner. All activities are offered with our guests in mind (we ensure safety without treating adults like children) and most are come and go. We even take activity suggestions!! Staff are available to assist with the kids so that grown-ups may enjoy the activities as well. Feel free to join in any offered activity or simply do your own thing. Our hot and filling meals are served family-style in rustic Nikana Lodge. We have a variety of offerings at every meal, including vegetarian options. Cold water, fresh fruit and peanut butter and jelly are available through-out the day. Cabins are selected prior to arrival and can be shared with friends, old and new. And best of all – we do all the cooking!!! Check-in is Wednesday afternoon; check-out is Saturday after brunch. We look forward to hearing from you and answering any questions. Spend some quality time with your kids! We'll do the cooking! Moms, grandmas, aunts and older sisters – take a break from the ordinary! Enjoy a weekend with those special kids in your life on the banks of Big Blue Lake!! We cook, we clean and we even entertain with activities like archery, bb guns, crafts, swimming and boating and horseback riding. For those adventurous guests, we offer a variety of high-challenge activities, including the high ropes course and climbing wall. Evenings include a campfire with songs, skits and s’mores, as well as a twilight hike for the truly brave. All activities are offered with our guests in mind and most are come and go. We even take activity suggestions!! Staff are available to assist with kids so that the grown-ups may enjoy the activities as well. Feel free to join in any offered activity or simply do your own thing. Meals are served family-style and always offer a variety of items to suit everyone’s palate. Cabins are chosen upon arrival and are available per family or to share with friends. Check-in is Friday afternoon; check-out is Sunday after brunch. Manly meals, maximum fun, mom-approved! 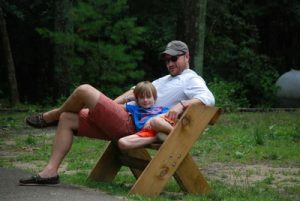 One of our longest standing traditions is our annual Father-Son Camp! Generations of men and boys come together for 3 days of laughter and bonding, as well as a darn good time. Activities are offered through-out the weekend and include archery, bb guns, crafts, swimming and boating and horseback riding. For those adventurous guests, we offer a variety of high challenge activities, including the high ropes course, climbing wall and zipline. We also offer White River Canoe trips, hikes to Sleepy Hollow and the immensely popular Ultimate Frisbee game. All activities are offered with our guests in mind (we ensure safety without treating adults like children) and most are come and go. We even take activity suggestions!! Staff are available to assist with kids so that the grown-ups may enjoy the activities as well. Feel free to join in any offered activity or simply do your own thing. As with our other family programs, meals are served family-style and are prepared with the hearty appetites of men in mind! Check-in is Friday afternoon; check-out is Sunday after lunch. Get away for a weekend of relaxation, camp activities and good company! Here is a weekend of fun, friendship, great food, and adventure for woman. All fitness levels are encouraged to join us, try some new activities, and enjoy a relaxing weekend. Check in at 6:30 p.m. on Friday evening and check out time is 11:00 a.m. on Sunday. Canoeing, Crafts, Climbing Wall, Kayaking, High Ropes Course, Zipline, Archery, Riflery, Hiking, Yoga and more! Feel free to bring your own bike with you. Participate in as many activities as you like! Spend the whole weekend reading in a chair by Big Blue Lake if you like... it's YOUR weekend. Hot and filling meals are served family-style in picturesque Nikana Lodge overseeing Big Blue Lake. We have a variety of offerings at every meal, including vegetarian options. Cold water, fresh fruit and sandwich fixings are available throughout the day. Cabin and facilities are rustic, but well-kept and clean. “Great Father and Son experience, loved the staff. A true family tradition."